Often when called upon to wring dry a book of humorous essays and report back as to the amount of cool, effervescent humor the volume contains, the reader is forced to admit that, upon reading it, he came away parched. That the slim volume in question, Gay Men Don’t Get Fat, contains many attributes common to the genre—typically ego, a certain grandiosity, and a disquieting need to more or less constantly poke the reader in the metaphoric rib with what passes for humor these days—is true, but, unfortunately, the humor (or what archly passes for it) is in very short supply. Which is to say that the funny book ain’t very funny, which turns out to be the least of our concerns. Seldom, you see, if ever, has a slim volume of what was intended to be humor—and we have the author’s word on this— so completely filled this reader with tsuris. From the first chapter (entitled “Screaming Mimis”) to the last (the thoroughly disconnected and unnecessary “The First Elf,” in which our author is called upon to decorate the White House Christmas tree), this reader found himself in turns bored, repulsed, confused, and irate with the material that Mr. Doonan selected for inclusion in his book of essays, Gay Men Don’t Get Fat. Research of course indicates that one need only exit from Barneys, turn one’s back on the windows, and walk left or right on Madison Avenue for a handful of blocks to prove how false his notion of veracity is, much less how nonsensical it would prove to be—and not in a fun way—if one were to visit, say, Ohio or Oklahoma or Alabama. But Mr. Doonan’s world seems comprised of select bits of select places—Manhattan, the Hamptons, the islands off the Atlantic coastline, and, if pressed to admit it he’d have to allow that these venues include only the richer and more famous parts of the West Coast as well—all of which allow him to research his topic without investing any time (or truth) in it. After all, this is all just for laughs, isn’t it? “The primary goal of this book is to extract useful nuggets and nuances from my gay life and hurl them in your direction, often with tremendous force and gusto. I want to liberate the women of the world—and maybe the men too—from those dreary heterosexual preconceived ideas and show them, by example, how to live life with the fearless, stylish bravado of us homos. Whether you are straight, thin, fat, bi, trans or just plain Chaz Bono, you can only benefit from a heapin’ helpin’ of my gay panache. “The secondary goal of this book is to make you laugh—something po-faced, humor-impaired Frenchwomen are constitutionally incapable of doing—thereby helping you to lose weight. I have a theory that laughter burns calories, but I have yet to support it with any conclusive data. With that in mind, I ask you to please weigh yourself now, and then weigh yourself when you have finished this book. From the best this reader can place it in the world cultural timeline by its references—gay men calling each other “Mary,” heterosexuals being called “Breeders,” The Boys in the Band listed as the second most “life-enhancingly fabulous” film of all time (“The birthplace of the bitchy zinger”), the use of Michelle Pfeiffer in Scarface and Shelley Duvall in Three Women as fashion references, and the seemingly endless use of the word “fabulous” to describe any and all members of that completely unified, politicized and bedazzled community of gay men in America—it seems to have been typed on an Underwood Standard about the time when Liza Minnelli was first sitting in Halston’s lap at Studio 54. Which is to place it sometime in 1979 or 1980. As noted above, the true issue with Gay Men Don’t Get Fat is not just that it is not funny, but in that it is, in parts, truly quite offensive. Simon Doonan seems to be living in a world of yesteryear when it comes to gay consciousness, gay accomplishments, and human (gay and non-gay) rights to the point that, when he mentions artist and retailer Jonathan Adler as his “husband,” the reader suspects that he is simply delusional, rather than thinking him up to date in terms of socio-sexual evolution. “Let’s take an analytical look at the pansy professions and see if we are able to come up with any common denominators. “First, and most important, it should be noted that the cliché gay professions are all innately slenderizing. Interior decorators don’t get fat because they are continually burning calories. When they aren’t rushing in and out of the D. and D. building clutching heavy bags of fabric swatches, they are flying around their clients’ apartments strewing decorative accessories and moving heavy escritoires. “The same is true of other poofy professions: If you don’t believe me, try zipping around a hair salon or a florist shop for an afternoon with a pedometer strapped to your Lanvin sneaker and then get back to me. You will basically have run the New York City Marathon. And not being gay, they are fat. Fat fat fat fat fat. But too lacking in a sense of self to stop stuffing guacamole and chips down their throats. Except for French women, of course. Simon Doonan has a special place in his heart for French women, who were, if memory serves the first cultural group not to get fat and to write about it. 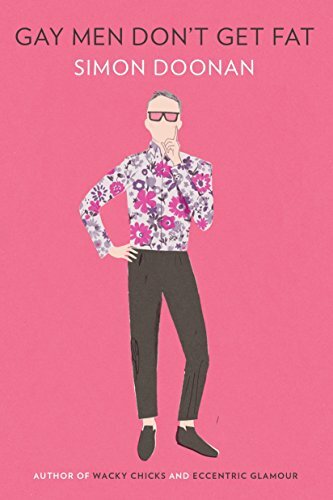 Such are the insights and such is the humor that, in writing Gay Men Don’t Get Fat, Simon Doonan is foisting upon us all. To him perhaps it’s best to say simply “Merci Buckets!” and leave things at that.